menstrual cycle, potential pregnancies or menopause, the female body needs to adapt to these various phases of life. So, women need nutrients specifically adapted for them. Even though, as a rule, women eat a healthier, more balanced diet than men, they still consume inadequate amounts of some nutrients. 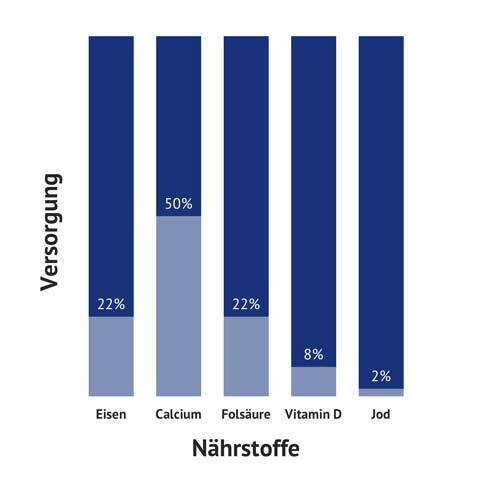 According to the current DEGS1 study conducted by the Robert Koch Institute, only 15 % of women and 7 % of men meet the recommendations of the German Nutrition Society. We should consume iron, the trace element, daily in sufficient quantity as it takes on manifold tasks in the body. It contributes, for example, to the formation of red blood cells and hemoglobin and supports the transportation of oxygen in the blood. Moreover, it plays an important role in the energy metabolism and the cell division. Menstruation makes women lose vital iron. In strong menstrual bleeding, the loss of iron can exceed the intake of iron, because 1 ml of blood contains an average of 0.5 mg iron. Women thus have a higher need, 15 mg iron, than men who have a daily need of 10 mg.
During pregnancy, the need for iron increases as the unborn child also requires the trace element for the blood supply and the building of inner organs. The quantity of blood in pregnant woman increases in order to ensure the blood circulation of the growing uterus. Her body now needs between 20 and 30 mg iron daily. The iron requirement remains high during lactation as the nursing mother must supply her baby with the trace element through the breast milk. Our tip: Help yourself more often to a piece of meat, because iron from animal sources is better absorbed by the human digestive system than iron from vegetable sources. But of course, legumes, vegetables and whole-grain products are good sources of iron as well. With vitamin C rich foods, such as orange juice, you can improve the intake of iron from vegetable sources. Naturally, it is not only women who need calcium, but also men. The mineral substance is an essential component of our bones and teeth, and this is exactly where approximately 99 % of the entire calcium content in the body is located. Calcium contributes to the normal bone maintenance, blood coagulation and muscle function. Our bones are subject to constant formation and deterioration, with the required calcium being dissolved away from the bone on demand. Since our body does not produce calcium itself, we have to ingest it with our food. The best known sources of calcium are milk and dairy products, but also plant-based foods, such as broccoli or hazelnuts contain calcium. The recommended daily intake of calcium through our food is 1000 mg. The fact is that in many phases of life, women need more calcium than men. During pregnancy and lactation, this mineral substance is indispensable both for mother and child since the baby needs calcium as well for building the bone structures. If not enough calcium is available, it will be withdrawn from the mother's bone tissue. Also in and after menopause, adequate intake of calcium plays an important role for women as declining bone density poses a health risk. The bone density declines with progressing age, since fewer sexual hormones regulating the calcium level are produced after menopause. Our tip: Ensure a sufficient supply of vitamin D. Vitamin D acts as a "calcium building helper" and thus contributes to normal bone maintenance. Our skin is able to produce vitamin D itself if exposed to sunlight, but in our latitudes, this intrinsic production is often insufficient, particularly in the fall and winter months.